Mix together and set aside till the end. 1 egg beaten mixed with 1/2 cup water put in a bowl. 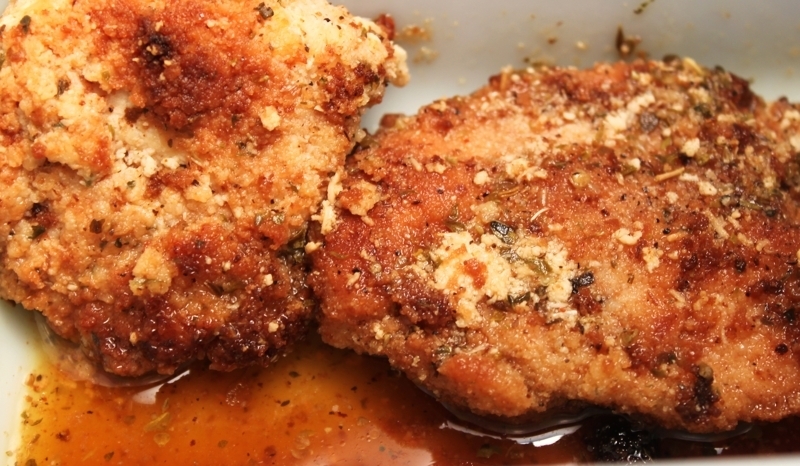 1/2 teaspoon each of garlic powder,dried oregano, parsley,and basil, 1/4 teaspoon salt, pepper and cayenne pepper. 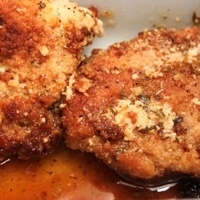 Shake chicken in flour mixture. Dip each piece in egg then breadcrumbs. Fry each piece in olive oil with a mixture of 2 tablespoons butter in pan, brown on both side, put into baking dish, keep warm in oven still serving on 200 degrees. Can't wait to prepare it! It does sound good....It is a step process and the recipe calls for the reader to slow down to process the steps. There is the sauce section, the breadcrumb section, and the preparing meat section. It did make sense to me. I will try this. Thank you. Claudia, another great recipe! It is definitely on my "must try" list! It looks delicious and nice and easy also.